How can adverse possession or squatters rights affect sellers and buyers? The term "squatters rights" is actually an old term dating back decades. The official term is "adverse possession" and it simply states that the person that lives in the property or uses the property is the rightful owner. However, many homeowners that have left their property vacant big to differ. The definition itself states that the possession must be hostile, exclusive and continuous under the claim of right. Over the last 10 years, we have seen several foreclosures, short sales, and distressed properties come under adverse possession and surprisingly many homeowners eventually lost the property rights. It seems ridiculous but it has happened and something that every property owner should be aware of, especially when leaving a property vacant for some time. If you've ever experienced adverse possession the first thing you want to do is speak with a lawyer. Different states offer different time requirements before adverse possession is entitled. We are also not talking about 5 to 10 months but more like a 10 to 15 years. However, it also does not have sent you the limitations on how many people actually own the property. For instance, if the current property owner can claim that they have met the elements of adverse possession, the courts will grant that portion of the property to the claimant regardless of how many times that person has sold it. Read more: Are Tiny Houses Really Cheap? It's not as easy as it sounds. Simply living in a property for some time does not automatically mean you own it unless there are certain qualifications that are met. In order to obtain the title to the property, the "squatter" must file a formal complaint in the court known as an "action for quiet title". Of course, this is time-consuming and it can be expensive, which is often why adverse possession doesn't follow through. Many people simply do not want to get involved in an expensive piece of litigation. This is most often seen with the neighbors, who one neighbor has owned a part of the property for years only to find out that it technically belong to another neighborhood. For instance: let's say to neighbors that are adjacent to each other 10 years ago neighbor A extended the fence line and put up a permanent shed on the property they thought was their own. Come to find out, the property, the shed, and the fence line or actually partially over neighbor B's Property. If neighbor B were to fight for the right to own part of the property back, they would have to go through the court system in order to prove that the property is technically vendors. Similarly, neighbor A would need to do the same in order to keep the property as is. If neighbor B decides to allow neighbor A to remain on their property they will need to send a certified letter stating that everyone understands neighbor A is on neighbor B's property and is allowed to use that property in a manner that is not adverse or hostile. It's always a good idea to renew this every 5 to 10 years with the permission of your neighbor. If the owner ever sells the property it's important to inform the new buyer of the arrangement. 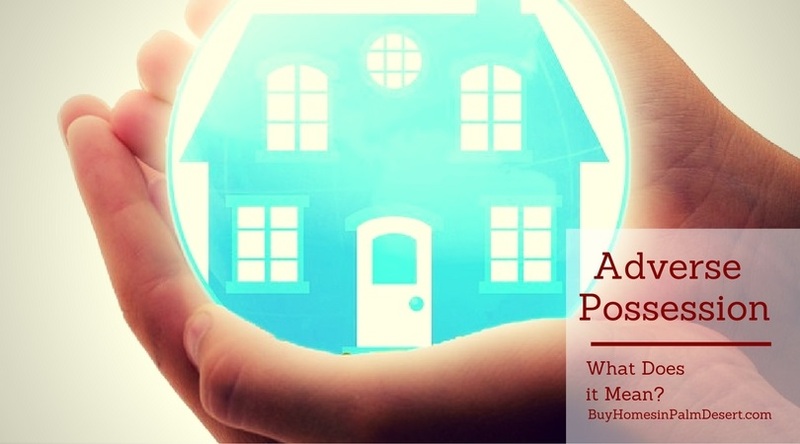 Adverse possession is not as complicated as it might sound and it doesn't mean that anyone could have a legal right to a property if the homeowner does not claim the property in a certain amount of time. In the state of California, adverse possession laws require at least five years of possession and payment of taxes throughout that. In order to be eligible for the legal title. This alone is enough of a reason that many people unlawfully in the property would be unable to claim adverse possession. For more answers to your questions on adverse possession, contact me today. Related: To Buy or Rent? Which is Better Right Now?